I read in today’s newspaper that environmental workers in Hyderabad, concerned about the declining Sparrow population in the cities, have launched a programme of distributing cardboard boxes for sparrows to nest in. Apparently, the plan is picking up steam and making a slow but steady progress. Well, more power to them. Over the last fifteen years or so I have been noticing the gradual disappearance of Sparrows from our homes. I remember that when I was a kid the sparrows used to be regular residents of our home. In fact it sometimes seemed that it was their home and we were the intruders. They would make untidy nests in ventilators, cornices, the upturned cups of ceiling fans and at times even behind framed photographs. The birds were very industrious, constantly bringing in straws and dry grass and would contribute to the dirtying of our home as much as us children. I remember my mother’s chagrin and the amused resignation at their antics. The males with their distinct plumage were as active as females in building nests and feeding the perpetually hungry baby sparrows. I remember the distinct cheep cheep and the wide open beaks of the brood when the parent sparrows brought food. Sometimes a baby would fall out of the nest much to the agitation of the parents. I and my sister would try to save the unfortunate fledgling by making a nest of cotton in a shoebox and offering it food and water but without exception they all died. I still do not know if it was despite our efforts or because of them. The remaining babies would grow fast and leave the nest and fly off. The flying lessons that the sparrows provided to the chicks were a source of constant entertainment for us. Occasionally an adult sparrow would dash against the whirring blades of a ceiling fan and die leaving us all very sad. The sparrows were such a constant presence in every house that we stopped noticing them as we grew up. 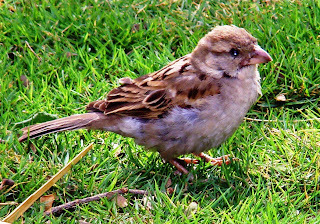 One day when I was talking about sparrows to my children my son told me that he had never seen one. I realized with a shock that sparrows had vanished from homes. I am told that the dense urban sprawl, high frequency waves from mobile towers and use of plastic pipes in place of cement ones have contributed to this decline in sparrow population. Since then I have been looking for sparrows everywhere I go. I have seen a few in condominiums in Gurgaon where they nest on the A Cs and a few in the holiday resorts where there are wide open spaces. I hope that sparrows make a comeback. I don’t want the present generation to grow up without seeing sparrows.